The names of some user interface elements include tokens which are variables whose value is determined dynamically by the context. Tokens are represented by a number enclosed in percent signs (e.g. "%1%"). Tokens must be included in the translation, but because different languages have different grammar rules, translators need to be aware of the type of information being handled in any given variable in any given context. The table below enumerates in English the elements whose names include tokens and for each gives a brief explanation of the nature of the variable and the context in which it occurs. Returns the user's account name in the user menu; clicked by the user to edit his or her user profile; appears on all pages. Returns the type of entity being viewed on the current page (e.g. archival description); appears as part of text on the list all button on edit pages. Returns the type of entity being viewed on the current page (e.g. authority record); appears as part of the page title on edit pages. Returns the type of entity being viewed on the current page (e.g. 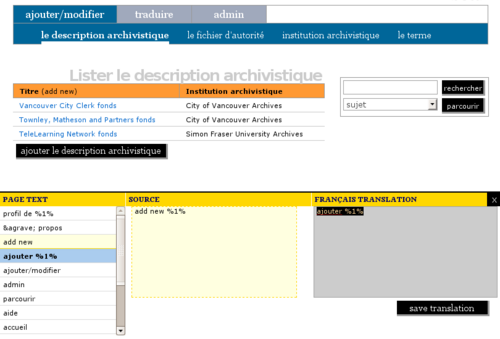 archival institution); appears as part of the page title on list pages. Returns the type of entity being viewed on the current page (e.g. archival description); appears as part of the page title on view pages. This page was last modified on 24 June 2010, at 20:08. This page has been accessed 11,294 times.